Small busenesses, non-profit organizations, lagre corporations - any companies planning to migrate database between MySQL and other DBMS. Software pack to migrate Oracle, PostgreSQL, SQL Server, IBM DB2, MS Access, FoxPro and SQLite databases to MySQL and vice versa. The product has high performance because it does not use ODBC or any other middleware software. Command line support allows to script, automate and schedule the conversion process. All versions of Windows and Linux/Unix MySQL servers are supported. 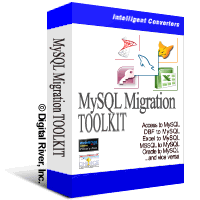 MySQL Migration Toolkit converts table definitions, data, indexes, foreign keys and views.